Presented in the durable GROHE StarLight chrome finish, this Eurostyle Cosmopolitan range kitchen tap will have a big impact on your kitchen. Designed to be wall-mounted, it comes with a range of handy technologies as standard. You can set the spout to position (0°) or let it swivel through 150° as required. 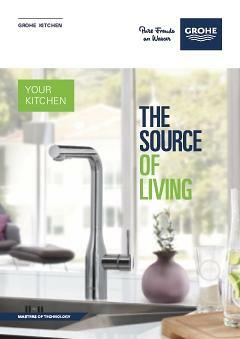 The built-in GROHE SilkMove technology lets you vary water temperature and flow with ease and precision. The GROHE plastic tray (18383002) is a handy add-on to the sink mixer. Easily fitted to the tap's flat upper plane, it offers space to keep your dish soap and kitchen sponge within reach. The selectable swivel range provides the convenient option of locking the spout in position (0°), for instance while washing the dishes, or setting it to swivel in a 150° radius, giving you all the flexibility you need when working with two basins or several pots.